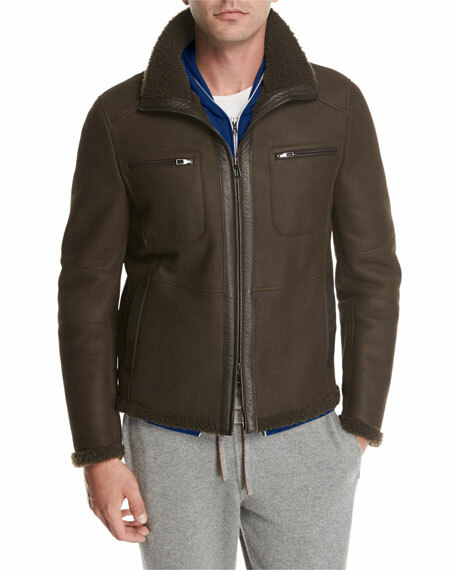 Loro Piana moto jacket in dyed lamb shearling (Portugal) and leather. Funnel neckline; full two-way zip front. For in-store inquiries, use sku #2204136. 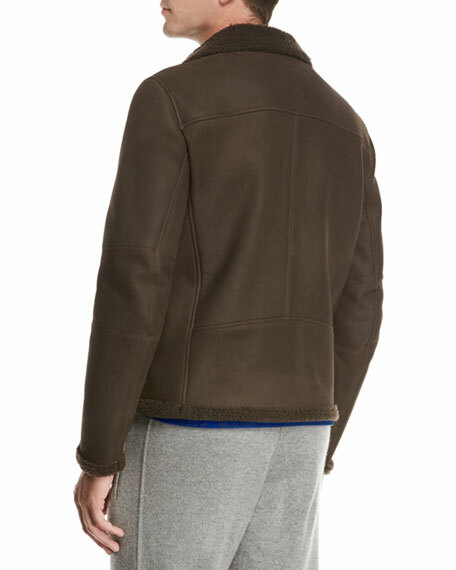 Loro Piana sweater jacket in heathered knit. Notched collar; three-button front. Four-button cuffs. Ticket pocket at left chest. Patch pockets at hips. Cutaway hem. Cashmere/nylon. Cupro lining. Goatskin trim. Made in Italy. Loro Piana "Icer" jacket in solid cashmere. Stand collar with contrast trim. Snap-placket hidden zip front. Snap-tab adjustable cuffs. Side slip pockets. Straight hem. Cotton/polyester lining. Polyester sleeve lining and fill. Goatskin trim. Made in Italy.